As expected the UK Government has now confirmed that registered EU IP Rights will automatically convert into national UK IP rights post-Brexit and will not be subject to any official Registry fee for such conversion. Following an earlier pilot project between the EPO, KIPO and USPTO, on the 1st July 2018 the IP5 offices launched a three-year pilot project to test a collaborative approach to producing PCT International Phase search reports. During the first two years of the pilot each of the IP5 offices will accept up to 100 applications into the pilot where they will act as the main ISA. Each of the IP5 ISAs will also act as peer ISAs to the main ISAs. The pilot involves no extra cost to applicants and only applications nominated by applicants can be accepted, subject to the current proviso that the international application is in English. The main ISAs will have up to 8-weeks to prepare and post a provisional ISR and written opinion and each of the peer ISAs will have up to 4-weeks from the posting of the provisional ISR and written opinion to review, perform any further searching and provide comments back to the main ISA. In light of any supplementary material and comments by the peer ISAs, the main ISA then has to produce a final ISR and written opinion within 4-weeks from the earlier of the expiry of the time limit for comments from the peer ISAs or when all the peer ISAs have provided comments. 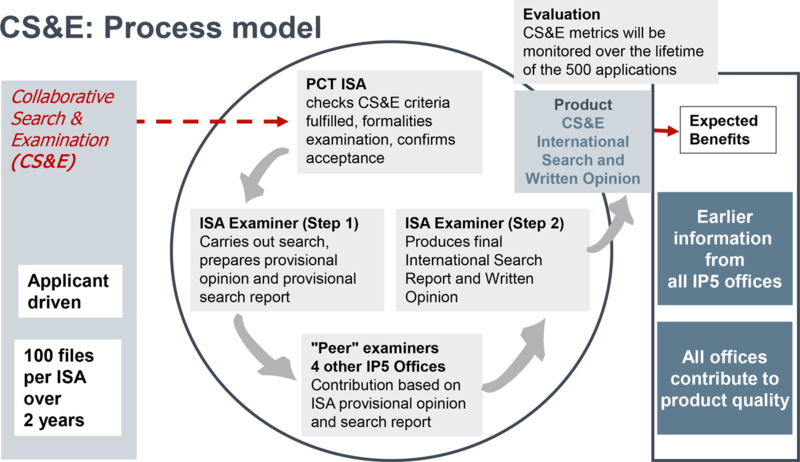 The final ISR will not refer to or explain any differences in opinion between the main ISA and the peer ISAs, but the contributions of the peer ISAs will be available to applicants through ePCT and will appear on Patentscope as separate documents when the ISR is published. The third year of the pilot will involve a study on the effects of the collaborative approach on national phase processing. A model of the process can be found here. In 2018 SGCA 18 Lee Tat Cheng v Maka GPS Technologies Pte Ltd the Singapore Court of Appeal held that the UK Supreme Court’s recent adoption of the doctrine of equivalents does not have precedential relevance for patent construction in Singapore. The Court of Appeal acknowledged that UK patent jurisprudence is generally highly relevant in Singapore. Specifically in regards to patent construction the UK decisions of Catnic Components Ltd v Hill & Smith Ltd  RPC 183; Improver Corporation v Remington Consumer Products Ltd  FSR 181; and Kirin-Amgen Inc v Hoechst Marion Roussel Ltd  RPC 9 have precedential relevance. Consequently, in the absence of a justification for a doctrine of equivalents in Singapore, the Court of Appeal held that applying such would be inconsistent with Singapore’s patent law as it would extend the scope of the claims beyond their purposive construction. It was considered that applying the doctrine of equivalents in Singapore would shift the balance between fair protection for patentees and providing a reasonable degree of certainty for third parties too far in favour of the patentee. Purposive construction is considered to provide the right balance by bounding the patentee to the language in which they chose to frame the claims, although interpreted in light of what the notional skilled addressee would understand the patentee to mean by the language used in the claims. The doctrine of equivalents was also seen as introducing uncertainty through increasing the risk of focussing on how the patented invention works in practice at the date of the alleged infringement rather than focusing on the patentee’s intended scope at the filing date. On 28th June 2018 a Republican Congressman introduced a Bill known as the Restoring American Leadership in Innovation Act of 2018 to the House of Representatives. The Bill has both Democrat and Republican members of Congress as co-sponsors. The Bill seeks to reverse many of the changes introduced by the America Invents Act (AIA) of 2011 as well as making changes that would open back up the patentability threshold from the restrictive interpretations that have been placed on it by the Supreme Court. The Bill would abolish the Patent Trial and Appeal Board (PTAB) and eliminate both the Inter-Partes Review (IPR) and Post-Grant Review (PGR) proceedings conducted by the PTAB. Those proceedings are characterised as harming the progress of science and the useful arts by subjecting inventors to serial non-judicial challenges to their patents. The Board of Patent Appeals and Interferences (BPAI) would be reinstituted in place of the PTAB, and would only be able to invalidate issued patents by way of Ex-Parte re-examination proceedings. The BPAI would also hear patent applicant’s appeals and hold interference proceedings to determine priority and patentability of inventions which are claimed in US patent applications. The AIA introduced first-to-file system would be repealed and the first-to-invent system reinstated. Patent applications would no longer be published at 18-months from the earliest filing date, but would instead only be published once granted. Prior applications that are subsequently published would not be considered prior art, which presumably means that more than one party could be issued rights to the same invention. Also, applicants would no longer be required to describe the preferred embodiment of the invention. Once granted, patents and their claims would be presumed valid, even where the claim is dependent upon a claim that is found to be invalid. The Bill would counter the restrictive patent eligibility interpretations given by the Supreme Court in Bilski (2010), Mayo (2012), Myriad (2013) and Alice (2014). Under the Bill the patent eligibility threshold would be lowered so as to be satisfied by any new and useful process, machine, manufacture, or composition of matter, with the exception of any invention that exists in nature independently of and prior to any human activity, or exists solely in the human mind. It would also clarify that eligibility is to be determined independently of novelty, inventive step and sufficiency considerations. Another Supreme Court ruling that the Bill would counter is the 2017 Impression Products Inc v Lexmark International Inc decision, which found patent rights to be exhausted by both local and foreign sales. The Bill would place emphasis on patents being private property rights with patentees being able to contract out of the patent exhaustion principle both in respect of sales and licensing. The Supreme Court’s 2006 decision in eBay Inc v MercExchange LLC would also be countered by presuming that patentees are entitled to immediate injunctive relief upon a finding that their patent has been infringed, even if they do not make or sell the patented product. Such presumption may only be overcome by clear and convincing evidence that further infringement would not cause irreparable harm. In the recent Court of Appeal for the Federal Circuit (CAFC) decision 16-2502 Interval Licensing LLC v AOL Inc the separate opinion of Judge Plager was critical of the two-step test the Supreme Court gave in Alice for determining whether a claimed invention is patent ineligible on account of merely being an abstract idea. Judge Plager then questions the necessity of the second step, asking: “if a court, after reviewing challenged claims in light of their terminology and written description, determines the claims to be ‘abstract’ in Step 1, how can the same court be expected to determine on a second reading that the same claims have become ‘un-abstract’ via Step 2?” However, this is a mischaracterisation of the Supreme Court’s test. The first step asks whether there is an abstract idea in the claim. It is only at step two that the more precise contours of what the abstract idea is are determined. Further, the Supreme Court emphasised the necessity of distinguishing between patents that claim the fundamental building blocks of human ingenuity and those that integrate the building blocks into something more. Hence, in relation to abstract ideas, the first step involves identifying not only whether there is an abstract idea in the claim but also whether it is a fundamental building block type abstract idea that would present a known and disproportionate risk of pre-empting innovation in a given technological field. However, Judge Plager also criticises the second step for asking whether the claims involve an inventive concept that is sufficient to transform an abstract idea into patent eligible subject matter. Here Judge Plager cites the significant legislative change effected by the Patents Act 1952, which rejected the search for an inventive concept in favour of asking if the claims involve non-obvious subject matter. This change was made because the concept of an inventive concept proved to be unworkable as it provided no discernible boundaries and resulted in an incoherent rule that led to arbitrary outcomes. The introduction of the non-obvious subject matter requirement in the Patents Act 1952 replaced the prior requirement for invention, with the result that when the non-obvious subject matter requirement has been complied with there is no further and different requirement called ‘invention’. Judge Plager notes that the issue of patent eligibility in relation to abstract ideas has been more prevalent lately on account of the rise of business method and software patent applications, and suggests that legislative change rather than further judicial consideration is required. However, in the interim the Judge suggests a procedural change that might reduce the risk of worthy patents being invalidated on patent eligibility grounds. While accepting that challenging a patent on laws of nature and natural phenomena grounds should take precedence to the grounds of novelty, obviousness and sufficiency, the Judge suggests that the precedence should be reversed in the case of abstract ideas. On 16th July 2018 Canada deposited its instrument of accession to the Geneva (1999) Act of the Hague Agreement, which will enter into force in Canada on 5th November 2018. Canadian applicants will need to file the international application directly with the International Bureau as the Canadian IPO will not act as a receiving office. The Canadian IPO will have 12 months from the international filing date to notify refusal of Canadian designations of international applications. The maximum duration of protection will be the later of 15 years from the date of international registration or 10 years from the date of registration in Canada.